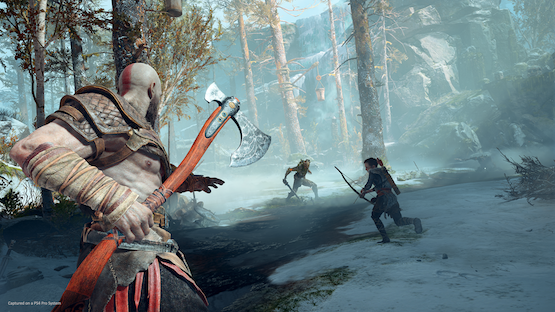 While there are definite similarities to previous games in the series, God of War has substantial changes when it comes to combat. 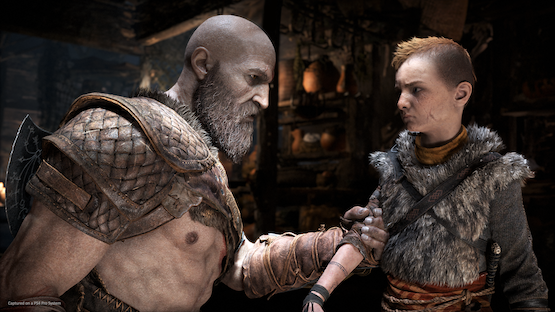 From the throwable axe to Kratos’ son, Atreus, who is valuable as both a distraction and a weapon, there’s plenty of nuance that players will have to get used to. I had the pleasure of talking to three members of the action game’s combat team: Lead Gameplay Designer Jason McDonald, Combat Designer Kate Salsman, and Lead Systems Designer Vince Napoli. Check out my interview below to learn more about God of War‘s combat system. Tyler Treese: With my hands-on time with the game, what really impressed me was how every encounter felt unique in that it never felt like filler content. What went into designing the combat exchanges, and making sure they never felt cookie cutter in design? Jason McDonald, Lead Gameplay Designer: Yeah, I mean a big part of this game was trying to make sure that the enemies had nuance. That you could play the same character multiple times and have fun depending on how many respawn or where they are. So for example, like for the Draugr in a roof pass area, you’ll see some up high, which kind of emphasize the ranged abilities. You’ll see guys spawn near pits where you can knock them out the arena, you’ll see the heavy guys come in and that kind of forces your strategy to change. There are ones that have the kind of arm fire power that throw the fireballs at you, that’ll change everything up. So, what we try to do is just make sure that encounter to encounter we do something that kind of puts an emphasis on a different set of Kratos’ abilities so you can have that variety you’re talking about. You talked about the range of abilities, which is certainly something the series has had in the past, but it feels like there’s more of a focus on it here and there’s more dimensions to the range of attacks like the axe. Can you discuss designing those and what it took to come up with that the axe? Jason McDonald: Throwable axe, you say? Well, this is the guy that came up with idea and kind of iterated upon. Vince Napoli, Lead Systems Designer: I mean we knew that we wanted a closer camera, so we knew that was going to kind of really change everything. We went how do we integrate sort of that camera feel into the gameplay and sort of how do we modernize action games and kind of combine a little bit of shooter elements? I think right from the get go it was like, “Okay, we want ranged and melee to kind of be hand in hand,” and that’s when we started having the ability to just kind like recall [the axe]. The fact that you can trip enemies and then bring it back and hit them on the way back, or if enemies have shields you can hit them from behind. Combining that with the punching, we basically sort of found our niche where it’s basically a ranged melee game, which is usually really tough to do. I felt like there was a lot of freedom in combat because even a mistake can be advantageous. Since you can recall the axe. Were all the mechanics designed with that in mind of letting the player have that sort of freedom? The series is definitely known for its boss encounters. We’re still seeing that huge scale and size here, but it’s very different due to the perspective change. How difficult was it implementing such dangerous enemies while still staying true to the new style of combat? Jason McDonald: Yeah, it was a challenge. 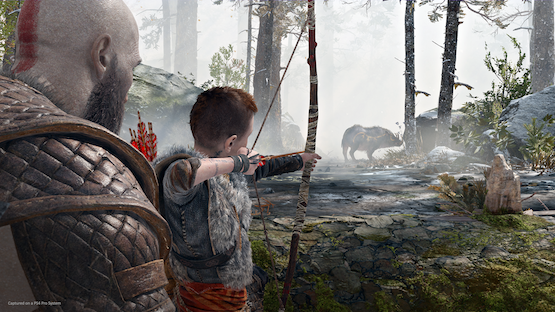 Like this game is definitely a fresh start for us to kind of just start from the beginning and go “OK, you know, with Cory’s new narrative and new kind of overall direction of the game, like what can we do to just make everything feel different and make everything still retain the same God of War feel before but from this new perspective?” So because of that, it’s like a tuning how large an enemy could even be before it gets too annoying to look up at him, or how many enemies can attack you from all directions, or what you should be targeting. We’ve made significant effort to kind of apply that to every new design. Cory stated that it took awhile for the combat to really come together, and really feel satisfying. Can you talk about the challenges of development and how far it’s come? Jason McDonald: Well, he’s wrong. Like it was perfect [whole team laughs] right down to everything. Yeah. I mean I think the first thing was just trying to figure out what was going to be the details of this game. You know, we knew that we’re going to try to bring the camera close. We did that right away and the first instinct was well we shouldn’t do this, you know, because we had the same old behavior pattern that we have for the enemies and things like that. So we were playing with that, with that close camera perspective and just seeing that OK this isn’t really working too well, maybe we should just go back to what we did before and we actually started doing that, like three iterations of like little internal play tests. We would start bringing the camera back and start changing things and then then it got so far back that were like, OK, now this is looking exactly like the older games. So, what can we do now? So what we did is we actually brought [the camera] way in and we brought it in closer than we even started to try to not do this hybrid thing, which is kind of far. We just went in close and we got a lot of people to play it and try to see like, “OK, from this perspective, like what do you think?” And like he was saying, once we added the axe throw capability that really worked really well for that perspective. It allowed Kratos to handle enemies at distance and close ranges like he used to do in the past. It just started to take off from there once we started just actually battling the problem of, “OK, what do you need to do?” That’s when all this stuff started to become more important because now that you’re right down in there, you can kind of really get the depth perception of those. I would just do this is right next to the wall and take advantage of that, and all that decision making started to take off. Vince Napoli: It also turned the corner to you when the son became [a part of gameplay]. I don’t know how much you use him in combat, but he’s actually like a massive tool that you have. He’s got a lot of abilities and a lot of behaviors that aren’t really accustomed to a lot of the enemies. Once we realized that with this limited camera perspective, having another character that can draw agro, protect you, call things out, or on command interrupted people and stun them was huge. So like once that tool came online, all of a sudden the cameras and stuff didn’t really become a hindrance. It became part of the gameplay of using him correctly. Like how well can you manipulate him just as well as your own character? I think that was like a big step. Atreus is definitely helpful dealing with the Revenant, which was one of the more difficult encounters I had. Tell me a bit about designing that fight because it’s such a different encounter compared to what you face early on? Kate Salsman, Combat Designer: Well, we tried to design her as more of an enforcer character who enforces a certain mechanic in the game. And so up to that point you’re mostly spent fighting Draugr s and you’re using your light and heavy attacks and axes, but to actually encounter an enemy where, “OK, that doesn’t work now, now I have to use another mechanic to fight her.” It’s kind of interesting and trains you to start considering other strategies and combat. So, we had a lot of iteration time early on because initially we were like, “OK, she dodges most of the time but not all the time.” And that could be confusing. So, we ended up going more towards the route of “OK, she’s an on/off type, a tight mechanic where unless you use the son to break her armor with his command arrows, then you just can’t hit her. So that becomes really interesting once you start seeing her with the Draugr in the other fight because it just forces you to change up your strategy. Can you talk about the design because it kind of teaches the player without going into an in your face tutorial because you’re organically teaching that player to use that mechanic. How important that is to the overall game design? Kate Salsman: I will say that, she’s kind of the first creature that teaches you, “Okay, I really do need to use the son arrows.” I mean before, he’s helpful in distracting enemies, but with her it kind of teaches you, “OK, this mechanic really is important,” and I will say that. We can only speak about what’s [in the demo] at this time, but using the son is important. Jason McDonald: Right at the beginning of the game we do kind of throw lots of tutorials at you because we want to make sure that you understand how this new God of War plays. So throughout the game we try to do things like that revenant where you know, naturally the son becomes more important, sometimes more of a forced importance and it kind of reminds you that he’s there. 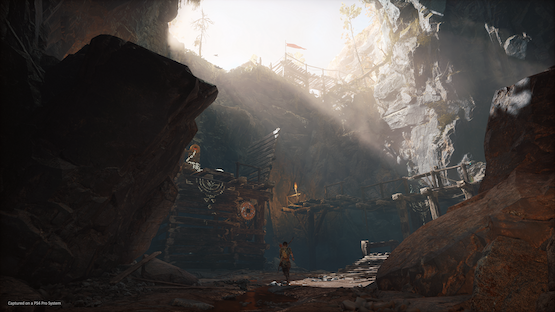 What we find is when people play the game and they fight her, it’s like if they maybe stopped using Atreus for awhile, they remember it right when you fight her and then after that they’re using it. And again it kind of creates this pacing where sometimes you might just be enjoying what he’s doing in the background and not really engaging with them as much, but then once you encounter characters like that, you start engaging with them and more, and then you start naturally engaging even more after that. God of War is such a popular franchise and it has a very passionate fan base. And since you’re rocking the boat a lot with this sequel, some of the fans have been displeased. Do you feel like once they get their hands on it, they’ll feel that like there is still that God of War DNA in it and that the combat feels familiar? Because I definitely felt that when I was playing that like there were moments where it was like, “Oh yeah, this is totally God of War.” Like there’s a new wrapping and I think it plays better than past games but a sense of familiarity is definitely there. Jason McDonald: That’s fantastic, and that’s exactly what I expect everybody to feel now. When you see the trailers and you see the kind of perspective, it’s understandable that you would look at that and go “Well no other games look like that. 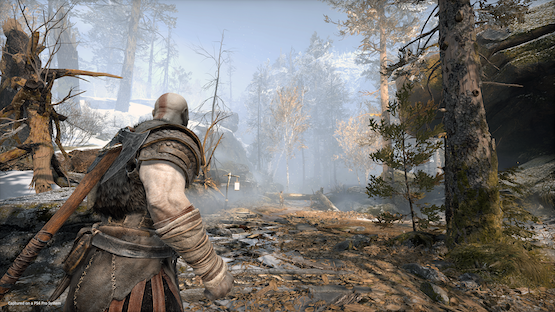 So how is this game going and be like, what is this game?” So I think that through four plus years of effort, we’ve been trying to make sure that with this new storytelling, with this new narrative, new mythology, like everything that’s new in this game, that it still has that God of War DNA. As the game continues, you’ll just see more and more of that. Were there any other action games that had an influence on the design, and figuring out the new camera? Jason McDonald: I don’t think so. The main thing that drew us to make decisions in this game, was just really getting to this new direction that Cory was bringing to the series. Like you really wanted to get up close and personal and you really wanted to get close to Atreus. So like he wanted all of these things in order to do that. Like I was saying, when we started playing with the camera distances and having a far back and close and whatever, and then we just ended up kind of gravitating to decisions that just helped with the core design philosophy of just like right up there, up and close brutality. Atreus right nearby at all times and always going with that. We’d like to give a major thank you to Jason, Vince, Kate and the team at Santa Monica Studio for letting us see God of War early. For even more coverage, check out our hands-on preview of the opening hours, and read our interview with director Cory Barlog. Disclosure: Travel and accommodation was provided by Sony for the trip.